Being part of a larger community is an important part of life at Temple Shalom. Through acts of tikkun olam, we help to heal our world by contributing to the lives of adults and families in our larger neighborhood. These projects are also an important social time for Temple Shalom members—a reminder of the values we share and the actions we take in a larger realm. Each November, Temple Shalom members get together in our own kosher kitchen to assemble fresh apple pies to be frozen and added to Thanksgiving food baskets distributed by the Medford Family Network. Our hard work brings joy and the sweetness of a fresh baked apple pie to dinner tables around Medford. We make the dough and peel the apples and put it all together in a beautiful pie. We also offer the congregation the opportunity to purchase one of our pies for their own Thanksgiving celebration. Throughout the year, and especially on the High Holidays, we have an ongoing food drive to support our local Community Cupboard Food Pantry. 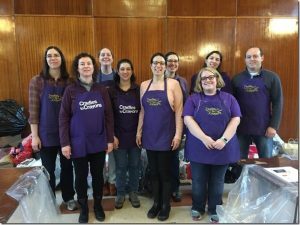 Temple Shalom Hebrew School partners with the Boston-based charity Cradles to Crayons to contribute to the 24/7 donation bin in our parking lot, one of the busiest donation sites in the Metro Boston area. 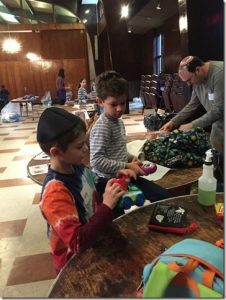 In January, the Hebrew School has a day of service for Cradles to Crayons, when our students bring items from their homes and participate in sorting and preparing the donations for local children in need. Three times a year, Temple Shalom hosts a free swap with The Medford Family Network. For a week before the event, Medford residents and neighbors donate children’s clothing, toys, and books. We then then open our doors for hundreds of local residents to choose items for their family.